Talk to whoever you can. Decide among your circle of friends that you will only talk in English with each other. This way you can get rid of hesitation and also have your friends correct you when you are wrong. Since you do not know them personally, you will feel less conscious about what they would feel about you. 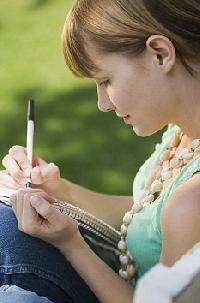 Maintaining a diary to record the events of your day is a great way to practice your writing skills. Take your time to use new words and phrases when you write in your diary. Read it aloud when you can. Concentrate on each word. Note down the words you don t understand and learn their meanings. Try to use these words in your own sentences. Watch English movies and English shows on television. Initially, you can read the sub titles to follow the conversation. As you practice more, you will realize that you are able to follow the conversation without needing to read the sub titles. This is one of the most effective ways of improving your comprehension. Podcasts are available on the internet. These are audio and video files and many of these can be downloaded for free. These are a great way to practice listening skills and develop an understanding of different accents. It is usually quite difficult for a beginner to understand the words of an English song as there is background music and the accent of the artist may be unfamiliar to the listener. Read the lyrics while you listen to the song and you will comprehend better. Once you start following the voice of a particular singer, you will find it much easier to understand the singer s other songs too. Another effective way is to record your own voice and listen to it. You will notice hesitations and pauses. You may also notice that you make some grammatical mistakes while speaking that you do not make while writing. You must aim to improve and rectify these mistakes in subsequent recordings. Ask people who speak better for advice. There is no shame in seeking help especially if you are trying to improve yourself. Talk to them in English and ask them to correct you whenever you are wrong.